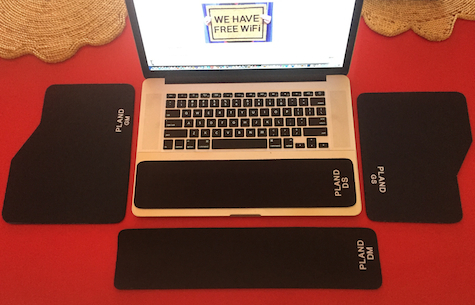 Pland are the best portable and desktop mouse pads I have ever used. They are in crowd-funding status, with plans for worldwide distribution in 2017. There are two models of Pland mouse pads. One is a long, narrow strip that covers the entire bottom of your laptop computer’s track pad and adjacent side areas. The other odd-shaped pad can be used for gaming when placed on the side of a laptop computer’s keyboard, or for desktop mousing when it’s on a flat surface such as table or desk, like a conventional mouse pad. Each model comes in three sizes, for a total of six different possibilities. Pland pads are not designed specifically for portable Macs. The small Working review unit pad is a bit undersized for my 15 inch MacBook Pro, and the medium size strip is a wee bit oversized. You quickly adapt to the Pland you’re using in either situation. The Gaming pads have an unusual shape with a size that is ideal for mousing with either left or right hand. My wrist rests on the narrow part and I mouse using the wider part. All Pland pads are black for now. The pads are thin and supple, and are easy to pack for travel. I stopped using any mouse pad years ago because modern mice track so well without a pad. Now that I’m using a Pland Working Pad for portable mousing and a Gaming Pad for desktop computing, my mouse efficiency and wrist comfort are increased dramatically. Be the first on your block! 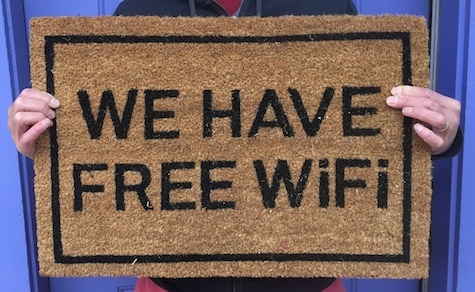 WE HAVE FREE WiFi. That’s what greets everyone who enters my funky home studio office. My wife was the first person to notice my new Clever Doormat, and she’s a tough sell. “That’s perfect for you, John,” she said with a chuckle. The physical doormat has a smallish footprint size and is just the right height, not too tall, with a pleasant feel to your feet wearing shoes. Construction is robust, and you easily can shake debris out of the mat. Seven other messages are available, from PLEASE KNOCK SO WE HAVE TIME TO CLEAN UP to STOP COLLABORATE & LISTEN. While Curt Blanchard was evaluating the SR (Studio Reference) model of Etymotic’s new flagship super-premium in-ear monitors (IEM), I was spending time with the company’s new XR (Extended Range) sibling product. Read Curt’s glowing praise of ER4SR. Then start saving. Both models are world-class personal listening equipment that are high-end both in quality and price. You will treasure them and you will never let anyone else borrow them. A large storage case is provided with a zillion sizes and shapes of ear tips. I tested SR and XR with a wide range of musical styles, genres, and playback sources. The sound from Curt’s SR buds was exceptionally clear, bright, and accurate, unlike anything I had heard previously, but the bottom end was lacking to my ears. I was concerned Etymotic’s XR audio spectrum would be too bass-heavy after reading the product description, and I was pleasantly surprised to be totally wrong. XR fills in the low range to complete the warmer sonic experience I sensed was lacking in the Studio Reference earphones. I am not a booming bass aficionado. You can achieve that obnoxious effect with the equalizer of your choice, but out of the box (after many hours of driver conditioning) and direct from an Apple product’s headphone jack you will hear exactly what came out of the recording studio, from excellent to dreadful. 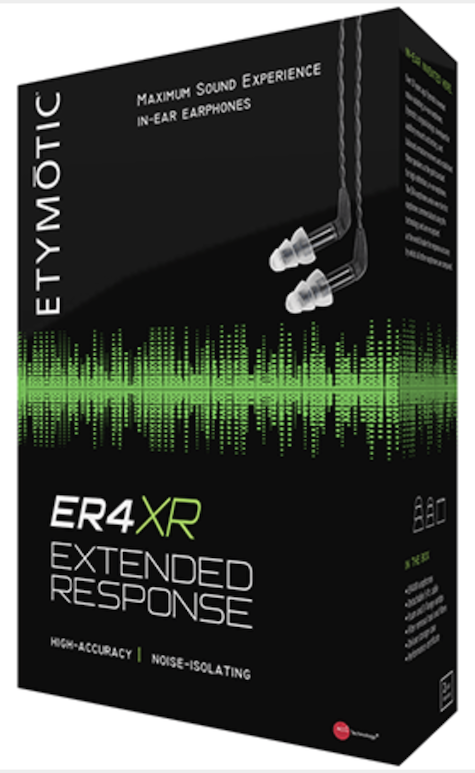 Whether you prefer the SR or XR model of Etymotic Research’s new ER4 Noise-Isolating In-Ear Premium Earphones, these will be the best earphones you experience to enjoy your music. As much as I rave about Etymotic Research’s ER4 series headphones, my ear canals are not compatible with a comfortable fit using the company’s included ear tips. Comply provided several tips with the narrow stem channel fittings specific to Etymotic’s unusual tip design. Comply™ Foam Tips are different from other tips included with IEM (in-ear monitor) headphones. Comply’s tips are squishy, somewhat firm foam that you squeeze and place in your ear canal. They expand to fill the space for a snug fit and a rich sound. It takes a few tries to perform the squeeze insertion perfectly each time, and it takes a little while to accept the feel of expanding foam. Be patient and you’ll be fine. Treat Comply™ Foam Tips with care and they will last a long time. Read reviews to help you choose which style and size of tips to begin your relationship with Comply, because you don’t want to spend more testing tips than you paid for your earphones. Contact the company directly for individual assistance if necessary.